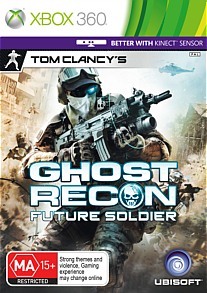 Tom Clancy's Ghost Recon Future Soldier 360 Review. In the end it’s a solid game that Ghost Recon fans can sink into the game and enjoy, the multiplayer action is well worth the price of admission. 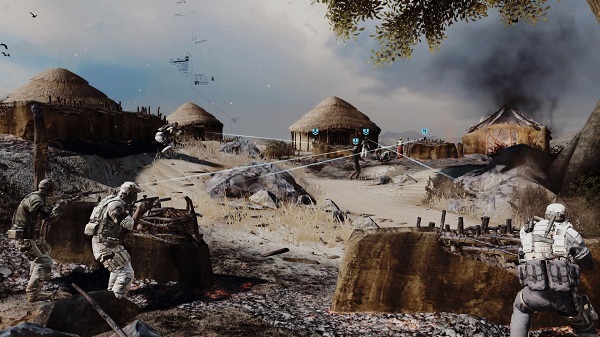 Ubisoft mission command sent over the latest for the Xbox 360, supporting some small section for optional Kinect play. The Game they sent: Tom Clancy’s Ghost Recon Future Soldier for us to take a look at. All of our gear was combat loaded and ready to go, all stowed in a way for the anticipated tactical operations coming up, to review this game. Donna (BooBear) Millheim finished up with G-2, having witnessed the Optional Kinect controls for gunsmith load outs and customization, giving her thoughts on a couple of the operational procedures in game off I went on mission. Before that I looked over the games jacket, trying to see if there was anything more to know before mission jump off. Just looking at its history one would think it was a real FUBAR. From time to announcement and original targeted date of the 2009-2010 fiscal year, it was delayed at that point to the 2010-2011 fiscal, and onward again to March quarter of 2011… I saw it for what it was, it wasn’t a FUBAR…why give a mission a green light if the operational readiness of the team is not there? They trained up, and now the time was right…. though not without a cluster F***s that hindered the first experiences. The game or at least this copy of the game defaulted into having the sub titles turned on. Silly me, I thought I could just go into the options menu while playing and turn them off. They are for me rather distracting. For some of our staff Like Donna Millheim, she likes having the sub titles. But it would have been nice to be able to turn them off. That was not going to happen, at least not in the menu that I thought I would be able to use to do that. No, you have to go out of the mission and go to the Extras menu and that is the place to find the options to turn off the sub titles. 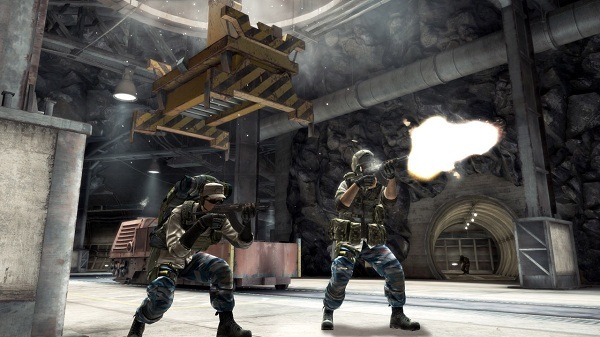 Tom Clancy’s Ghost Recon Future Soldier has managed a very delicate balance between all out action fire fights and the high tension of stealth tactics. Getting in and getting out. That is why we love the Tom Clancy Ghost Recon Series, it strives and delivers tactical action and strives to innovate, stimulate and entertain on each outing. Sure that can be said for other games that come out, but for this series and Tom Clancy’s Ghost recon Future Soldier, it really shows. The total package does not make it a military simulator or full blown tactical shooter. Instead it marries several elements together; doing its best to balance them all and bring in new fans, and keep the longtime fans pleased. The stories as it is are more along the lines of multiple missions strung together. Each one of the missions offers interesting situations. Part of them are tracking things down, the opening brings us yet another nuke on the loose. This soon Segway’s into another Ghost team heading out on different missions to some of the deadliest hot spots on the planet. The missions to hunt down high value targets, sometimes on a rescue mission, and sometimes in the middle of the mission things and priorities change. Just like the real world. The game does a spectacular job at showing that uncertain feeling of a fluid mission. A lot can happen. Sometimes the game feels like it’s on rails giving the player little choice in the matter on where to go and how to get the job done. In this it forces the player to be part of an elite unit in the game. It may not be for everyone, and it took me two missions in to really start to appreciate the overall experience the game relays. It’s a balance the designers tried for and for the most part have accomplished it. Most of the missions have a stealth element, sometimes stealth is paramount and required to get to a certain point, if you are found out its mission over. After these points the team somehow inevitably is found out and queue the fire fight. This seems like part of the adventure, to be found out and fight your way out. That’s ok; it is a good adventure, though it would have been one heck of a mission to try to get through a section without being found out at all. In and out like a Ghost. The main campaign sports 12 missions and 8 locations, the terrain and situations that take place are varied enough to keep it very interesting. We are talking desert like areas, refugee camps, suburbs and the ice and snow of the Arctic. One of the other things that they do so well here is mixing in civilians, when the bullets start to fly and everyone is taking off in all directions in a panic, it can get very tense. When you accidently shoot a civilian it hits you, the anger the frustration. The game throws a few curve balls your way to keep you thinking. Including like stated earlier, stealth elements, where you must not be discovered, there are also points of the mission that a countdown timer pops up and things really kick into gear. That part of the mission has to be accomplished in that short time or it is over. Soldiers get all the toys, and The Ghost recon team gets the cream of the crop. To aid in stealth there is the Optical Camouflage. As long as you’re moving slow and steady and no one is close to you, you get the upper hand and move through areas without firing a shot…if you are really good. Moving stealthily through an area, if you happen to come up on an enemy combatant and they have their back turned you can use a silenced weapon, or you can move in close and take them out hand to hand. Busting in on the enemy or coming in on several combatants in an area, what is a Ghost to do? Using a Tag feature in the game and tagging targets, when all of your team has aimed at a target you tagged, you can do a synchronized shot this takes out all of the targets within a second of each other. The sync shot can also be set up by use of a drone. If you have never played A Ghost Recon game before, the Drone is a flying unit armed with a camera that you can send in and see what’s ahead. This time around it does a lot more; tagging enemy is one of them. Other than the standard fragmentation grenade, there is a sensor grenade that once thrown highlights all enemies within its range of influence. Then there are the guns, and Gunsmith. With Gunsmith mode you have an insane amount of options to customize your weapons. Through game play you unlock extras and extra weapon parts. There are various attachments and components to swap out that effect the weapons performance. You can replace triggers, the weapons barrel, the stock, the sights…and it goes on and on. Once you get the perfect weapon for yourself you can try it out on the firing range before using it in game, so you can see if your changes are working out for you the way you hoped. 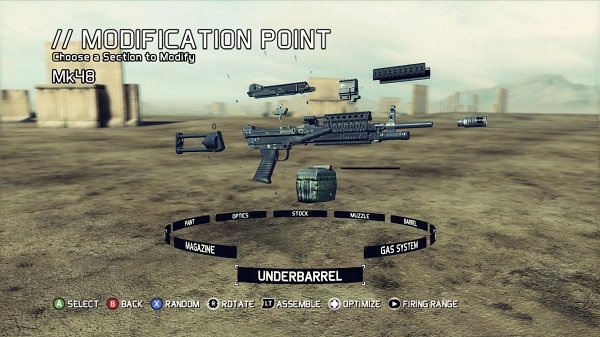 Within the Xbox 360 version of Tom Clancy’s Ghost Recon Future Soldier, there is an optional Kinect feature for Gunsmith. It is both voice operated and motion activated. Even after taking the tutorial for this section three times, the section was not as responsive as I would have liked it to be. Again, the Kinect use is only an option; you can turn it off in the options menu. I turned it off and enjoyed the heck out of trying out different configurations in Gunsmith. Control of the character and combat all is very smooth; the cover system works rather well. When the bullets are flying putting something solid or something that will slow down those rounds coming at you is the smart tactical choice. If you are a running a gunning gamer, you won’t last long here. Graphically this is not one of the best games I have ever seen. Human heads on your team seem a bit boxy. I would wear face masks too if I had a square head. Environments look believable and varied enough to keep you interested. With wind storms and other affects that bloom on screen. Blowing stuff up looks good. Sounds, oh the sounds if you do not have a surround sound system you may be missing this robust sounding game. Bullet hits and gun fire all have a solid sound, with echo in certain environments. Stellar sounds indeed. The different game modes round this title out very well, from its single player campaign, to the incredibly fun multiplayer experience. First off, multiplayer wise, you can play the campaign mode co-op with three of your friends. To really notch it up if you just crave the combat, there is Guerrilla mode. In this mode you infiltrate and capture an area. Then the real fun begins, you have to hold that area and hold of up to 50 waves of enemies. With each wave ramping up the difficulty it tends to get insane very fast. 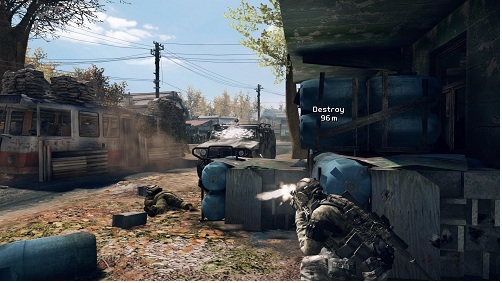 Guerilla Mode supports you and three players online, or two players using split screen play. For faster paced action there is the tried and true 12 player online in 6 Vs. 6 combat. During these matches, you can choose from 3 different soldier classes. Each one of these soldier classes are vital in their role in a multiplayer match. They are Scout, Engineer, and of course the rifleman. Online at this time has 10 maps for all the multiplayer mayhem. This was the same multiplayer that was in the closed and later open betas with plenty of tweaks along the way. It is just as fun if not more so now. Especially if you get with a team that does actual tactics rather than rushing off on their own to die miserably. Tom Clancy’s Ghost Recon Future Soldier hits the scene sporting some minor battle damage, but it does not over shadow the fact that this is a pretty awesome freaking game. We can call the optional Kinect feature a failed experiment, turn the feature off and you will enjoy the game with no problem. Coolness if they ever smooth it out better. For now this is one Ghost team that will have to go on mission without the Kinect Tech. In the end it’s a solid game that Ghost Recon fans can sink into the game and enjoy, the multiplayer action is well worth the price of admission. The single player experience juggles so many different elements; one’s opinion may conclude that the designers tried too hard to include several different types of gamers. The action between stealth and full on fire fights is understandable, because that’s just how it is in real-life and it would be boring as hell to just have a military based game with nothing but stealth and no gun play. Some of it seems forced at times and that may be what takes just enough away from making this a perfect game. I like the mix though; this is a worthy addition to the Ghost Recon Franchise. See you on the battle field.